Argo Navis Firmware Version 3.0.1 available for download! Argo Navis Manuel Utilisateur Édition 11 en langue française - merci Michel Perdrix! Argo Navis User Manual Edition 11 available for download! Argonaut Version 2.0 for Windows available for download! Wildcard Innovations is proud to present an exciting device for the dedicated observer. The Argo Navis™ Digital Telescope Computer (DTC) brings not only accurate positioning information to your telescope but also provides an enormous detailed database of tens of thousands of celestial objects. Stars, asterisms, galaxies, globular clusters, open clusters, planetary nebula, nebula, planets, asteroids, comets, earth-orbiting satellites and more. Magnitudes, surface brightnesses, object sizes, common names, stellar classifications, stellar luminosity classes, double star separations, Hubble galaxy morphologies, constellation, detailed parameters of planets, comets, asteroids, satellites, lunar phases and a wealth of other information are available at your fingertips with a simple spin of the dial. A large range of mounts can accommodate the Argo Navis™ including Dobsonians, German Equatorials, Forks, Equatorial Tables and Binocular Chairs. After fitting a pair of optical encoders to your mount, using the Argo Navis™ is simple. Perform a quick two star alignment and off you go. No need to level your mount. It's fast and easy. As you move your scope, objects of interest are reported to you on the display in real-time. Argo Navis™ has a powerful 32 bit CPU at its heart that will guide you continuously to keep track of satellites. The sophisticated software even accounts for precession and atmospheric refraction. A battery backed real-time clock provides local time, UTC time, Julian date and sidereal time. There's even a stopwatch facility for timing astrophotography exposures and a built-in audible event alarm. Using the innovative Intelligent Editing System™, objects can be accessed quickly and easily by name without the need for a cumbersome keypad - even while wearing gloves! The unit's operation is completely standalone. In addition, you can also interface it to your favourite planetarium program running on your PC, Mac, iPad, iPhone or Android smartphone or tablet. Using the supplied Argonaut™ utility, you can even download your own user defined objects and descriptions into the unit's FLASH memory. The unit will also interface to a servo or stepper motor controller such as the ServoCAT™. You'll appreciate the dimmable red liquid crystal display carefully designed to preserve your night vision. A stylish and versatile mounting cradle allows the Argo Navis™ unit to be affixed to any type of mount in a variety of ways. The Argo Navis™ is a 'must-have' accessory for all observers. It offers many more features than conventional Digital Setting Circle (DSC) devices. For example, the Argo Navis™ DTC comes with in-built TPAS™ - Telescope Pointing Analysis System™. Normally, effects such as geometric mount fabrication errors, gravitational flexures, eccentricities in bearings, etc. can affect your pointing accuracy. Not any more! TPAS™ allows the user to perform a star pointing test and it can compute, report and compensate for many of these types of systematic errors. 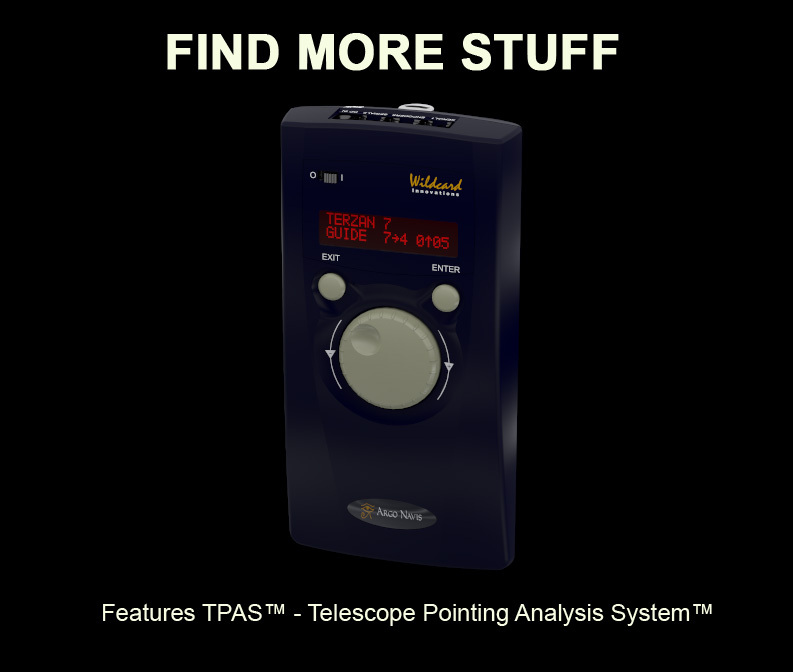 TPAS™ works on all mount types, including Alt/Az (Dobsonian) and Equatorials. As a bonus, for Equatorial mounts it can report the amount of polar misalignment in both axes and it can assist the user in refining the alignment. It's faster and easier than a drift test and unlike a drift test, also takes the other fabrication errors into account at the same time. Argo Navis™ allows you to save, label and switch between four sets of setup parameters. If you own multiple mounts, you can easily share the unit between them. Please take the time to check out the technical specifications.